Nursing care of the ‘at risk’ and sick neonates requires a complex mix of skills. On the one hand, a stable growing, low birth weight baby requires only basic nursing encompassing warmth, asepsis, spoon or gavage feeding, clinical monitoring and lactation support to the mother. On the other hand critically sick neonates demand sophisticated nursing management including invasive monitoring, ventilation, parenteral nutrition and other life support measures. It is to the credit of the newborn nurses that they are able to master these diverse role, one closer to being a caring mother and the other akin to being a critical care specialist. It is this challenge that sets newborn nursing apart from other specialties. It is this charm that inspires the most talented among the profession to opt to work in neonatal nurseries. India has witnessed a rapid growth of neonatal nurseries in recent years. Although the fundamental principles of neonatal care remain the same as practiced in developed countries, a major insight and effort are needed to adapt them to the prevailing technological advances. 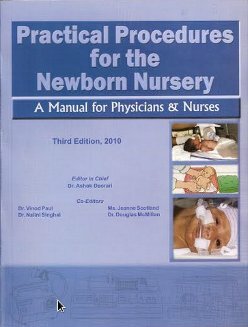 This compilation of practical procedures for the newborn nursery is an attempt to disseminate what we have learnt in our unit over the years. 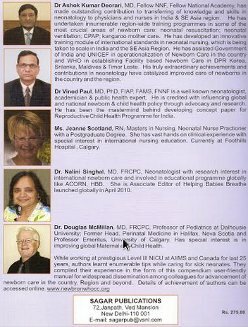 It is also an effort to present a simple practical and do-able approach to newborn care, synthesizing both science with the art of nursing. Each protocol deals in details with the rationale of the activity and description of every step, precautions and tips. These protocols, however should be viewed as generic in nature. Suitable adaptation may be done at individual centres through in consultation with the concerned physicians and nurses. Since these guidelines need to be reviewed periodically (at least every two yearly or more often as required), as new knowledge takes over and ones own experience becomes richer. This revised edition has been brought out by our team of nurses and doctors. A number of changes have been incorporated based on evidence and changing policies in the unit. Six posters on kangaroo mother care, hand washing, expression of breast milk, hypothermia prevention, skin care and chest physiotherapy are included. These protocols are not just for nurses to read, practice and follow. All physician working in the units must also imbibe them and fine-tune their approach to newborn care accordingly. Good newborn units can thrive only if there is consensual approach, team work, rapport and mutual respect between the nurses and the physicians. Consenting to follow the agreed protocols for the care of the baby always serves as a catalyst for further ideas to improve care. The Editors are indebted to the contributors for their outstanding efforts in compilation of these protocols. We would like to express our appreciation to Mrs. Tessy Varghese for diligent word-processing of the manuscript and Shri Saurabh Sagar of Sagar Publication for publishing this book under his expert supervision. We would appreciate your suggestions and comments for future editions of the book.